Dont speak much portugese yet I got a kick out of your Linspotting video. Downloading Caixa Mágica as I write this, just to try the task-video-editing package. Do you recommend the 32 or 64-bit version ? 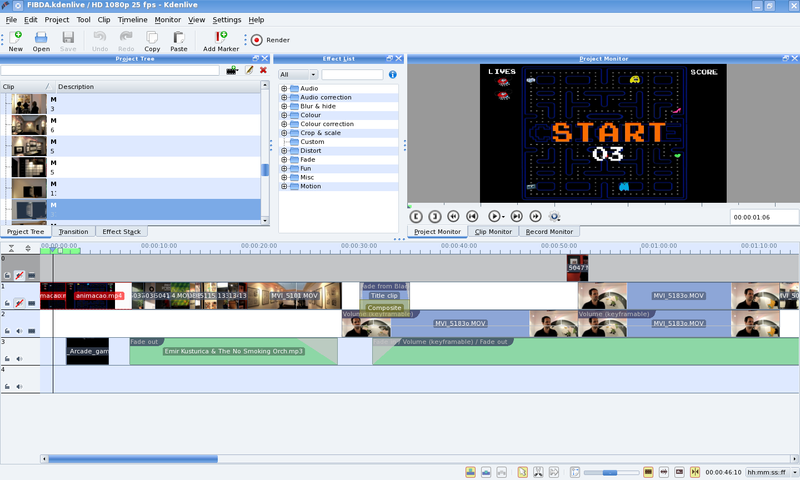 Have been trying for ages to find a pro video editing workflow in Linux. It is not about any "magic bullet" application... It is about workflow quality, usability and stability, so your Linspotting project hits the nail right on the head. Already using ffmpeg + MLT + OpenShot + handbrake + Avidemux + Devede, but it isnt always easy to configure all the codecs and dependencies for my students in Linux Mint, plus OS has some severe limitations such as lack of Waveform, Color Correction and Quantization Encoding to avoid quality loss, so RPM and KDE here we go! Both 32 and 64 bit versions were tested and work. If you have a 64 bit machine the 64 OS should be faster. Thanks Panoramix. Indeed a 64-bit capable machine would run slightlty faster, but just as important, as page 6 of the Linspotting manual states, be able to recognize 8 Gb of RAM, very useful for Full HD editing. Very impressed, to say the least, with Caixa Mágica 15, not only did it recognize the hardware brightness controls and system fan of my Dell Vostro 3700 laptop, something only Linux Mint does, but the live cd did activate both Broadcom 4353 Wireless and Nvidia VGA... something no other Linux distro had ever done ! (not even PCLinuxOS). Can anyone please share what repos should be added and how to go about it in Caixa Mágica? Very surprised there isnt a single Caixa Mágica review in Distrowatch.. Im considering writing about it and Linspotting in my next blog entry !! You must have the "contribuicoes" repository active in apt. You can do that via the Synatic GUI. It is pre-installed, it may at most have to be activated for the meta-packaqe to be found. Don't forget to reload / update the repo info. Yup. Just opening Synaptic Package Manager> Configuration> Repositories and activating the very last repo listed: http://ftp.caixamagica.pt/15/contribuicoes/X86_64/media/ did the trick. Thanks for the great manual too. Its Linux pro video "slice'n dice" time ! Great that it worked well. Have fun!